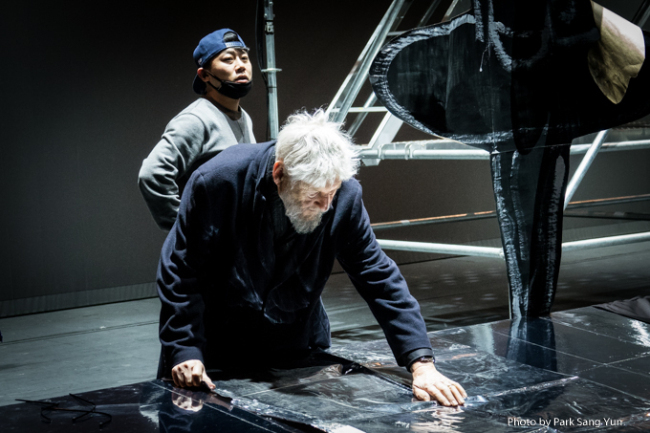 Acclaimed German artist Achim Freyer will stage “Der Ring des Nibelungen,” one of Wagner’s “Gesamtkunstwerk,” -- a term coined by the composer, meaning a work of art making use of various art forms -- in Seoul over a period of nearly two years. “We finished a three-hour bauprobe (staging try-out) at the Seoul Arts Center on Monday without singers. Wagner’s “Der Ring des Nibelungen,” is a magnificent piece and a precious present given to us because it’s an archetype work in which its intellectual quality goes beyond the time, I believe,” Freyer said at a press conference in Seoul on Wednesday. Freyer will produce the four-part “Ring Cycle” in Korea -- 17 hours in all -- starting with the “Das Rheingold” at Seoul Arts Center on Nov. 11. “Die Walkure” will follow in April 2019 and “Siegfried” in December 2019 before the final opera “Gotter Dammerung” is performed in May 2020. “I have previously staged “Ring” in both LA (between 2009 and 2011) and in Germany. But the ‘Ring’ this time will become a totally different production from the other two. The text and music will remain the same, but I have taken a different approach to the opera,” said Freyer. “It cannot be the same. You work with different people. Political context has changed over time, Fashion trends have changed. Basically, everything has changed. The world we are currently living in is different from that of 10 years ago. Thus, interpretation (of ‘Ring’) is as well subjected to change,” Freyer added. Freyer’s new “Ring” here is drawing attention as the artist is again deeply involved in every aspect of the production, ranging from lighting to stage installations and even paintings on the backdrops. His deep involvement in the stage preparation is not surprising given that he originally focused on visual arts before he met German playwright Bertolt Brecht. Things changed after he met with Brecht, to whom he was a meisterschuler (master student). “Brecht is (to me) a taste of freedom. If I get consumed from making stage works, I revisit Brecht and feel free,” Freyer told the Korea Herald at the press conference. 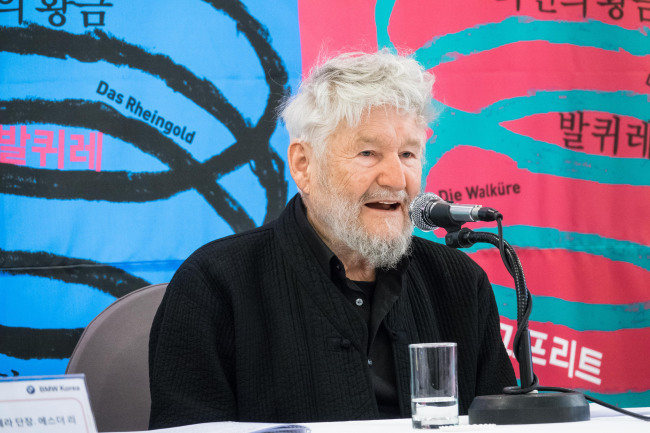 Freyer said that he wants to make the audience talk about the opera production, make them see reflections of themselves on the stage and make them question themselves, as well as the realities that surround them -- the core concept of “dialectical theatre,” which Brecht pioneered. “A successful party is where people bustle with talk. The same applies to the theater. If a production makes the audience talk about the work, as well as to converse and question themselves, the work is a successful one,” Freyer said. Freyer and his production team also aim to incorporate Wagnerian elements into the production, the music in particular. The production team is thinking of a way to cover the orchestral pit, to produce an effect similar to that of the Bayreuth Festival Theater, according to Matthias Fletzberger, artistic director. The Bayreuth Festspielhaus auditorium is well-known for its design, which allows the orchestra pit to be hidden between the front row and the stage, adding sublimity to opera performances. Wagner himself is known to have been involved in the architectural design. “It takes time to prepare the orchestra, and it applies to the singers as well,” Fletzberger said, explaining the reason for spreading out the productions. “Wagner’s operas are difficult to perform. It requires an experienced orchestra and singers,” Fletzberger added. Andreas Scager and Stefan Vinke are doubled-cast for the role of Siegfried. “There aren’t many singers who can perform Siegfried in ‘Ring’ and Tristan in ‘Tristan un Isolde.’ There are now perhaps three, and the two have joined Freyer’s production,” said Fletzberger. Korea Wagner Orchestra, a project orchestra of 82 musicians, will perform the “Ring Cycle,” according to Esther Lee, president of World Art Opera. For “Das Rheingold,” the orchestra will be conducted by Ralf Weikert. The 12 billion-won budget ($11 million) project is partly supported by BMW Korea.